Paparazzi, photophiles, and other proponents of peeking at people’s private photographs, rejoice! 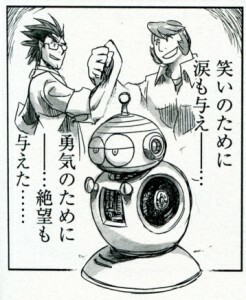 The Rockman Daizukan has published pictures pertaining to our plucky robot protagonist’s personal portfolio! What intimate secrets does it hold? Actually, it’s just a lot of old pictures that you’ve probably seen a bunch of times already. But, you probably haven’t seen them with Rock’s own personal commentary before, now have you? Have you? Fine, maybe you have. I don’t know. A great gathering with everyone, even Wily and all the enemy bosses!! All the main characters that appear in Rockman, behind the scenes as you’ve never seen them before!! These delightful secret snapshots finally have their grand unveiling! Rock: I’ll show you my most cherished photos from my personal album! This photo was taken to commemorate the battles with the Rockman and Rockman 2 bosses. Grumpy to the last, Cutman was grumbling something about “No way I’m standing next to Rockman!” Bombman even thew up a V sign. There’s Dr. Wily working in one of Capcom’s offices, studying the stack of postcards with all the new boss robot ideas that all of you submitted. Now here’s a side of Dr. Wily we rarely get to see! Even an evil genius scientist like Dr. Wily is still affectionate towards his own robots. This is me playing around in the Sniper Armor, a Wily Machine from Rockman 2 that I defeated and then took for a spin. Bones are Rush’s favorite, of course. He’s always been a really great friend. When we tried to take the Rockman 3 commemorative boss battle photograph, all the other bosses, Wily himself, and even Blues showed up to crash the picture! Gutsman even boosted Roll up onto his shoulders. Cutman was still acting cross of course, especially after Snakeman kind of trampled him over. Rockman group photobomb, neat. This is another one of those scenarios that sort of breaks the fourth wall, where Rock and the others are apparently aware that they’re game characters created by Capcom, a lot like the Ask Me! columns, or the Upon a Star. But why did they… to poor Cutman… This running gag was referenced again in Rockman 8 with the grumpy sideways Cutman dolls in Clownman’s stage. 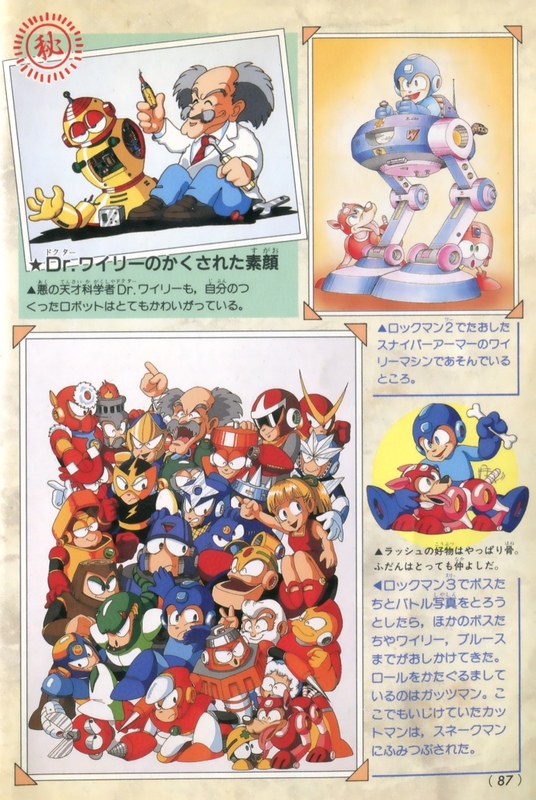 The picture with the dis-armed yellow robot makes several appearances, usually whenever they want to make Wily appear comical or less-than-evil. Sometimes he even got bit speaking roles, though he never had a name or any significant meaning attached until Ariga reimagined him as an experimental robot Right and Wily worked on together in their college years, becoming a symbol of the two men’s former friendship and once shared hopes and dreams for robot-kind. Manly tears, gentlemen. According to the story, the Sniper Armor was originally a support item for Rockman (remember Items 1, 2, and 3 from Rockman 2? Well, this would have pretty much been Item 4) before its design was pilfered by Dr. Wily. That’s why this one has a 4 on it. 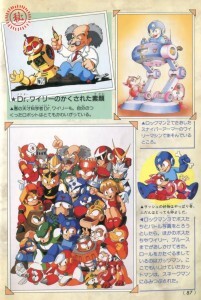 The picture itself was actually designed to be the cover of the Rockman Character Collection book, and was one of the first chances many fans got to see the newest support character at the time (whose name was not revealed), Eddie. 7 Comments to "Rock’s Top Secret Photos Revealed!" It’s only on that one piece, too. The original sniper armor art has different details. 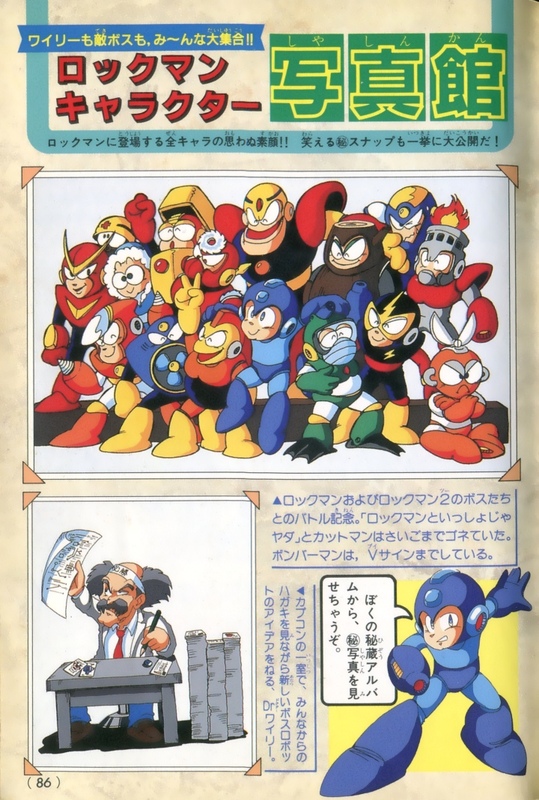 And if you have Mega Man Megamix volume 3, you can see that Ariga placed a “2” over the “4” since he wanted the numbers to correspond with the characters’ first game appearances (from “The Evil Genius Dr. Wily’s Robots 101”). Prototype Ride Armor? XD Also never noticed the 4 before. Some of those were in R20, but it is the first time I saw the one of Wily examining boss submissions. 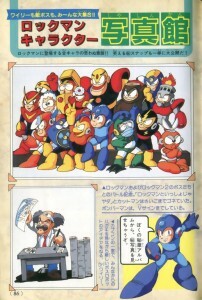 That one of Wily is in the R20 book, same page as the message from Keiji Inafune, towards the back. “Protagonist” instead of “hero.” Your alliteration was going so well, too. In an episode of Captain N based on Mega Man 2 (or parts of it, anyway), “The Big Game,” Dr. Light– er, Wright/Right sends some gear to help everyone out. Among them are their interpretation of items from MM2… and a big Sniper Armor-esque thing, too. If you’re friends with P, well then you’re friends with me.